Okay, you convinced me at bacon. I love bacon wrapped anything. 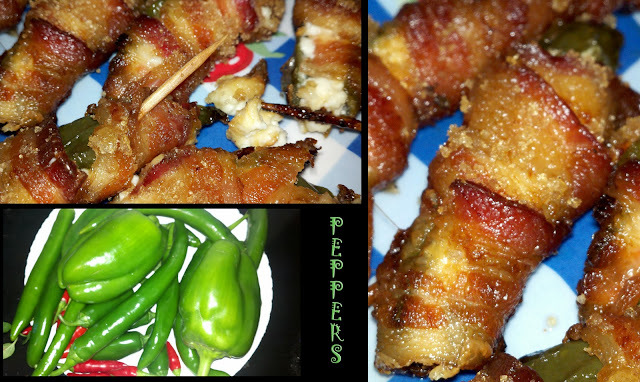 I think I'll grow jalapenos just so I can make this recipe. LOL. Thanks for sharing! We have been grooving to your music.....all your recipes look wonderful, the kids and I are getting hungry from looking at them all! Kelly, I have the same problem! Thank goodness for calorieless window shopping. I don't have any jalepenos, but a slew of hot peppers and I am always trying to find ways to use them. I'm going to make the bacon wrapped poppers. Wonder how they will taste with turkey bacon? That is a good question. I havent tried turkey bacon. In fact i always cook my turkey bacon in the microwave to make sure it crisps the way i like it. Does it get crisp in the oven? I bet it would work.